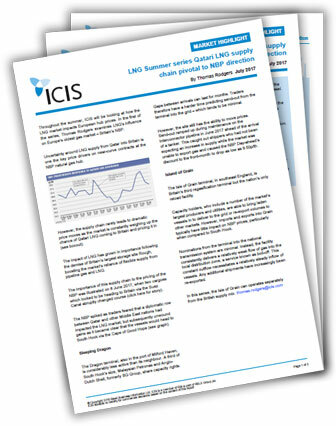 Throughout the summer, ICIS will be looking at how the LNG market impacts European hub prices. In the first of the series, Thomas Rodgers examines LNG’s influence on Europe’s oldest gas market – Britain’s NBP. Uncertainty around LNG supply from Qatar into Britain is one the key price drivers on near-curve contracts at the NBP natural gas hub. However, the supply chain rarely leads to dramatic price moves as the market is constantly weighing up the chance of Qatari LNG coming to Britain and pricing it in.